Length: 24". Armpit to Armpit: 18". 100% Linen. 26” length from top to bottom hem. Loose and flowy Eileen Fisher gauzy white linen top featuring light gray stripes, a v neckline with tie. 100% Italian Linen. Length: 24". Wasit: 19". Talbots Button-Front Shirt. Blue and White Striped. 100% Linen. In good pre-owned condition - no stains or holes. Size petite S (oversized) ~ bust 47" ~ length 25". Breton striped lightweight knit three-quarter sleeve pullover top. Drop shoulders. Button detailing on sleeves. Material: 55% Linen, 45% Cotton. Color: White, Black. Size: Petite Large. Color & Pattern: Blue Striped. Material: 55% Linen 45% Cotton. Type: Knit Top. All should be Cleaned, washed or dry-cleaned as prescribed by the Manufacture before wearing. Croft & Barrow Striped Collared Shirt. Linen Blend. For Cynthia PL Petite Tunic Top 100% Linen. A pre owned linen blend top by J Jill. Made of 43% linen/41% viscose/7% Cotton/5% nylon/4% polyester. An orange and white striped loose knit top. Has a U shaped neck. The sleeves are 3/4 length. There are decorative buttons on the shoulders. Design: Simple linen top with a line of mother-of-pearl buttons down the back. Materials: 100% Linen. Shoulder to Hem: 25". Sleeve Length: 17.5". Fresh linen blouse ready for a sunny beach day. Featuring box pleats, subtle stripes, high-low hem and cropped cap sleeves. Keyhole button closure on back. Falls to low hip. 44” bust, with lose flowy hem. Note that there may be color shade and hue variances due to different monitors and device settings. Bottom of collar to hem (back) = 25”. Width at bottom = 22.5”. Shoulder to hem (front) = 26.25”. As shown in photos. Boden USA Oxford. 100% Linen. sleeve length- 22.5 in. no flaws to note. Lightweight linen fabric with multi-directional stripes is combined with a relaxed fit and boat neckline on Charter Club's petite tunic top. Size PL Petite Large. Machine washable. Pit to Pit: 20.5" Wide. I make every effort to make sure your item arrives to you as described. I appreciate the opportunity to make any issues right. Armpit-Armpit-18.5". Lands' End. Cap Sleeve, Pleated, Wide Striped Shirt. Pit to Pit(. 100% Linen. There areNO Major Flaws with this item, and is Free and Clear Of any. We are only human and may make a mistake once in a while. ). Great condition, no flaws, only minimal signs of prior wear. This is an olive/army green in color with an off white contrast stripe. Features: Striped, Scoop Neck. pit to pit: 20”. sleeve (pit to cuff): 19”. The length was taken from the shoulder seam. Size: Petite Small. Fabric: 100% Linen. length: 24. (From top of shoulder to bottom of shirt). 100% LINEN. ~SHOULDER TO HEM 24.5". Pre-owned Condition - See Photos! Arm Length (Pit to End of Sleeve): 17". Length (Shoulder to Bottom Hem): 24". Shoulder to Shoulder: 15". Linen blend button front shirt with long sleeves. 96% linen and 4% rayon. Sleeve length (from shoulder seam to cuff hem) - 22. Length (from mid-shoulder to hem down the front) - 25. Waist (laying flat) - 19. In lightweight linen, this striped tee from Ralph Lauren is an effortlessly chic weekend go-to that drapes beautifully on the body. Elbow length sleeves with turn-back cuffs. Curved hem. Slightly sheer. 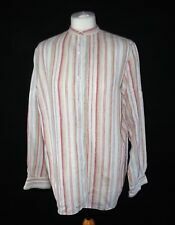 J Jill Love Linen Petites Button Down Blouse Size Small Pink Stripe Shirt Top. SIZE: Petite's Small. COLOR: Pink White Striped. Length from back of neck: 25". Labelled as PETITE UK 16. 100% Linen (Flax). New Look Cotton Linen Stripe Tie Knot Front Peplum Frill Top Size 14 Petite. Dispatched with Royal Mail 2nd Class. LAUREN RALPH LAUREN soft washed linen shirt. subtle soft stripes. great shirt for jeans. Often as quickly as three, depending on all sorts of lovely Irish variables. Sent out to you fresh, clean and pretty - ready to wear. Beautiful, beige, striped top/blouse with short sleeves. Expect signs of creasing and little fluffs accumulated from other clothing such as woolly jumpers. Minimal signs of wear and very faint wear marks on the neck. MINT VELVET Linen Jumper Trendy Sweater Top Layered Striped Breton Sailor. Otherwise in great pre-worn condition. Pure linen fine, textured knit. A cute pink striped shirt with flared sleeves.The material is lightweight. The fabric has no stretch. There are no fastenings. T he size on the label is a Large. A loose fitting top. All faults are clearly described. EILEEN FISHER. LINEN KNIT STRIPED SWEATER TEE. Material Linen. Sleeve Length Short Sleeve. Size Type Petites. Blue Striped Pattern. Pattern Striped. Sleeve Style Short Sleeve. Short Sleeves. Country/Region of Manufacture China. Button Up. RALPH LAUREN. Linen / cotton / silk. knit sleeveless top. Style Tunic. Material Linen Blend. Pattern Striped. Sleeve Style Sleeveless. - 1.5" hi/low hem. Machine wash. Definitions;. Material Linen Blend. Pattern Striped. Sleeve Style Sleeveless. Machine wash. - button-down front. 25.5" front. - 1.5" hi/low hem. Scrubs (5). Swimwear (50). Swimwear (23). Swimwear (617). Swimwear (1364). If applicable, any protective inner lining must be intact. Product Line Lauren. Product Line: Lauren.